My research expertise is on computational materials science and mechanics, emphasizing two areas: (1) nanostructured polymeric materials and (2) biomolecular and bioinspired materials. My career goal is to establish theory and simulation-driven approaches to understanding the physics of soft materials at multiple-length scales, typically utilizing molecular dynamics and theoretical approaches. I envision that creating faster and more accurate computational methods, and also learning from biological design principles, will accelerate the design of new materials for structural use, separations, and broader applications relevant to energy, environment, and infrastructure. Designing biomolecular and polymeric materials by theory-driven approaches remains at its infancy because of the dynamic nature of these systems at the nanoscale, and because of the intricacy of the nanoscale interfaces in these systems. 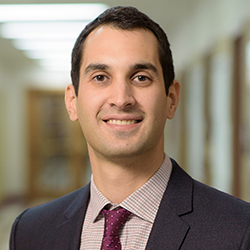 Sinan Keten's teaching interests include mechanics of materials, statics and dynamics classes at the undergraduate level, as well as atomistic modeling and simulation of materials. He is also interested in the development of online simulation tools that provide for a hands-on, practical learning environment for students.